Coin-op Misc. Game published 12 years ago by Simuline, Inc.
Mini Rider 2 © 2007 Simuline, Incorporated. 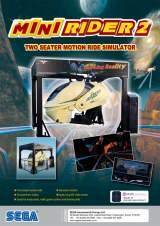 Mini Rider 2 is a 2-seater motion ride simulator. There are 4 different rides to experience, including a roller coaster ride, a space journey through the cosmos, a ride through icy glaciers, and a ride through an underground mine shaft.